When most people think of a rodent, the first thing they picture is a rat or a mouse. However, it is important to remember that the world of rodents goes far and beyond your typical house mouse or rat. Other rodents include but are not limited to squirrels, gophers, beavers, porcupines, and many more. The reason rats and mice are the rodents that people most commonly associate being in their home is because the odds of finding a beaver or a porcupine in your basement is slim to none. However, homeowners everywhere find both rats and mice in their space on a daily basis. Not only are these well-known rodents sure to invade your cabinets and crawl through the walls of your home as you sleep but they will also move harmful bacteria that they find in your trash and on your food prep stations all around your house. The good news is, you don’t have to live with these pests or the illnesses they can bring into your home. In this post, you can uncover some tips that will help you to eliminate both rats and mice from where you live. There are many different things that can lure both rats and mice onto your property. However, there are several things that are the main contributors to these pests showing up in your home. Follow the steps below to make sure you are not making your house an optimal location for rodents to find shelter. There are plenty of different items that can end up in your trash that mice consider to be food. The smell of these items alone are enough to attract rodents. If you have no cover on your trash can, these pests can easily get into it. In fact, mice can jump in the air up to one foot and rats can jump 2 feet vertically! Putting a cover on your trash can will help to decrease the chances of these rodents rummaging through your trash. If there are a good number of items in your yard for decor or any other reason, you may want to consider removing them. Rats are especially known for burrowing beneath junk piles and mice like to use your belonging to hide. Even something as simple as a firewood pile could be attracting rodents to your property. Rodents, especially mice and rats will always establish their homes near a water source. If you have any water that has pooled in your yard, or you have pipes leaking in some portion of your home, you could be asking for rodents to infest your property. It is common knowledge that both mice and rats are attracted to areas where they can be covered and therefore feel safe. Often this is a place that where vegetation is overgrown. If you want to make sure you are deterring these creatures from holing up in your space, make sure you keep all of the plants trimmed around your property. One of the best ways you can protect your home from rodents is to keep an eye out for them. The sooner you can identify that you have a rat or mouse problem, the sooner you can take care of it. You can do this by simply being observant. Sometimes you may even be able to catch a mouse or rat as they travel from one area of your home to another. Additional ways to identify when you have a rodent problem is to keep an eye out for a number of things like droppings left near walls, chewing damage, holes that have been dug in the ground, the smell of urine, or grease marks of your walls. You may also want to consider placing traps around your home if you suspect you may have a rodent problem. When mice and rats are adventuring around the outside walls of your home, it is very important that they do not find any entry points. You may think a tiny hole here and there can’t be that bad but it truthfully takes a very small opening for a mouse to wiggle his way into your home. Be sure that you inspect your outside walls often to ensure you are not giving rodents an easy way to come into your home. If a rat or mouse cannot find food in your home, the chances of them staying there for an extended amount of time is slim to none. By limiting potential meals for these critters, you can basically eliminate them entirely. Do this by making sure to thoroughly clean areas in your home where food is often made or eaten. Sweep your floors often, wipe down all surfaces, take out your trash, and make sure that you have stored any food that comes in a paper or cardboard container in an alternative container that is plastic and impervious to the gnawing habits of rodents. 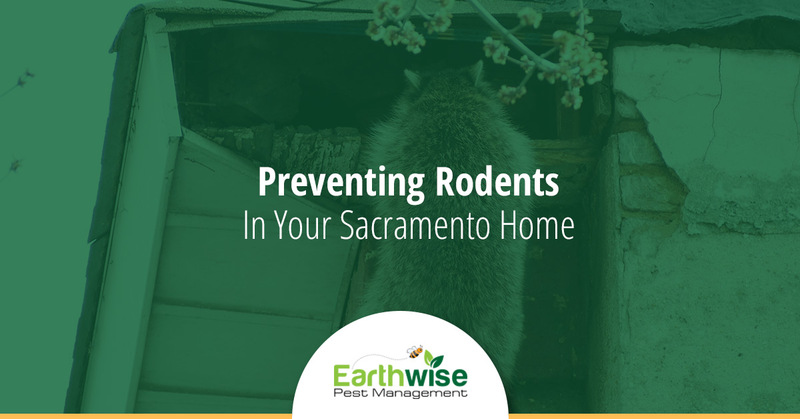 If you are unable to identify if you have a rodent problem, or you know you do but you cannot seem to remedy it on your own, it’s time to call the professionals at Earthwise Pest Management. We know precisely how to get rid of both mice and rats quickly and at an affordable price. Call us today and find out how we can help you to make your entire property safer!